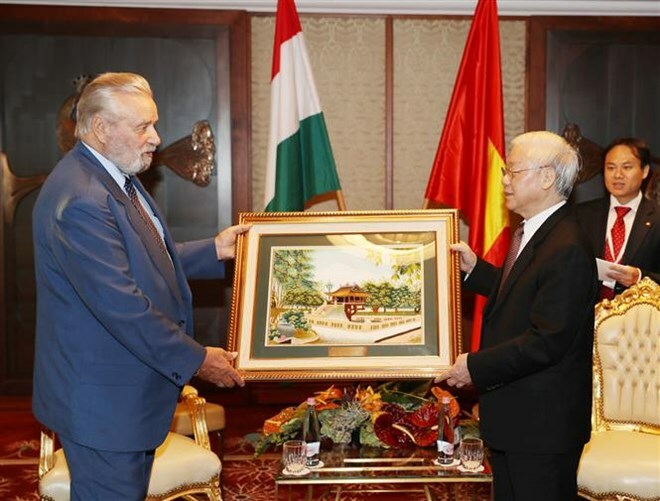 The Hungary-Vietnam Friendship Association has made significant contributions to nurturing and developing the friendship and cooperation between the two countries, General Secretary of the Communist Party of Vietnam Central Committee Nguyen Phu Trong has said. Hosting a reception for Chairman Botz Laszlo and members of the association in Budapest on September 10 as part of his official visit to Hungary, the Party chief underlined that both nations have long-lasting relations which have been increasingly fortified over the years, and they are celebrating 70th anniversary of diplomatic ties. A line-up of activities have been carried out to boost all-round cooperation, he said, adding that Hungary has backed Vietnam during its national development, especially in education and training. The Vietnamese Party leader said that during talks and meetings, Hungarian leaders expressed their wish to foster sound friendship and cooperation with Vietnam, and agreed to elevate the bilateral relations to a comprehensive partnership. He took the occasion to thank the friendship association for its efforts in promoting the friendship and collaboration between the two nations. Being upbeat about the prospects of the Vietnam-Hungary relations, Party General Secretary Trong voiced his hope that the association will continue effective and practical activities to further develop the bilateral ties. “We are always good friends and comrades of each other. Chairman of the association is always a close friend of Vietnam”, he stressed. Botz Laszlo, for his part, briefed the Vietnamese leader on the association’s development, saying it has paid due attention to supporting and connecting small and medium enterprises of Hungary with Vietnamese partners, along with accelerating friendship and cooperation between localities of both sides. The Hungary-Vietnam Friendship Association has good relations with the Vietnamese community in Hungary and the Vietnam-Hungary Friendship Association’s chapters in Hanoi and Ho Chi Minh City.